Super Bowl Sunday is almost here. If you’re looking for a snack that you can eat without guilt while all of your friends and family are stuffing their faces with chips and guacamole, have I got a treat for you. Make that two treats! There are plenty of low-fat dips out there–I have almost two dozen right here–but I often have trouble finding low-calorie foods to scoop them up with. Homemade baked tortilla chips are fine, but they’re far from calorie free. And I can chomp on only so many carrot sticks before I start to turn orange. 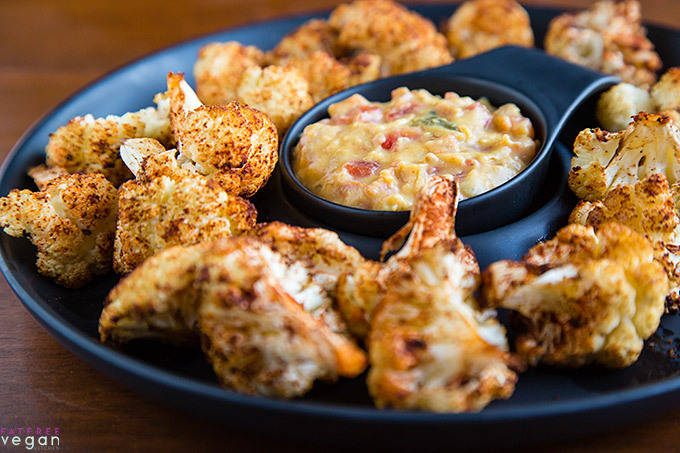 These cauliflower bites are the perfect scooper: cooked but still a little crispy and healthy but highly seasoned. You can turn these into Buffalo Bites by tossing them with your favorite hot sauce after they’ve baked for 15 minutes; then continue baking until done. Preheat oven to 400F. Line a baking sheet with parchment paper or silicone baking mat. Cut the cauliflower into individual bite-sized florets. Try to keep them about the same size. Rinse them in a colander under running water. Shake off excess water but don’t dry. Spread them out on the baking sheet. Combine all seasonings in a small bowl. Sprinkle over the cauliflower, turning the florets so that all sides are seasoned. Bake in preheated oven for 15 minutes; turn florets and bake another 15 minutes or until they are beginning to brown in spots. Remove and serve warm with nacho cheese or other dipping sauce. Zero Weight Watchers Freestyle points. This is my new favorite party dip. 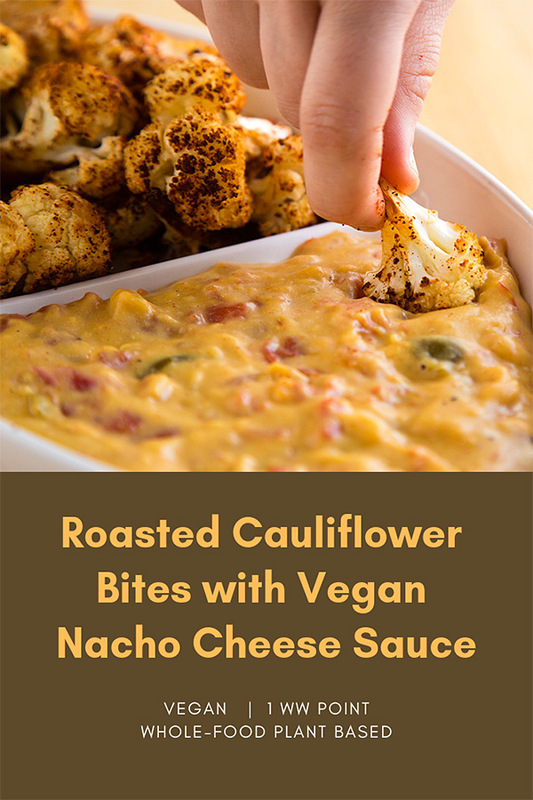 I’ve been making nacho cheese sauce for years, mixing the sauce from my Macaroni and Cheeze with salsa, but I really love this version for its flavor and for the fact that it contains no nuts, seeds, or nut butters. Instead, it gets some of its richness and color from mashed sweet potato. I start with a base of lightly-flavored cheese sauce and stir in a can of the original Rotel Diced Tomatoes and Chilies, which gives it a medium-spicy flavor. Rotel makes several flavors, so if you’re a spice-lover, you can use their hot version and if you don’t like the spicy, use the mild version. Whichever one you choose, you will be amazed at how rich and cheesy this spicy dip tastes. You can make this as spicy as you like by increasing the amount of chipotle chili powder you use. Put all ingredients except Rotel tomatoes and chipotle into the blender. Blend at high speed until smooth. Pour into a saucepan and cook, stirring constantly, over medium-high heat until boiling. Reduce heat to low and continue cooking and stirring until mixture becomes very thick. Stir in the drained tomatoes. If sauce is too thick, add a tablespoon or so of the reserved tomato liquid. Check seasoning, and add chipotle powder to taste if you’d like it spicier. 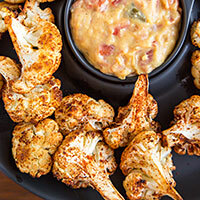 Serve warm with Roasted Cauliflower Bites, tortilla chips, or crackers or atop burritos and tacos. Note: I use an unfortifued nutritional yeast called Foods Alive after discovering that vitamins used to fortify yeast can be harmful. Makes about 2 cups. Each serving is a quarter cup. Nutritional data uses 1 cup of plain soymilk. Other plant milks will change data. Each serving is 1 point on Weight Watchers Freestyle program. 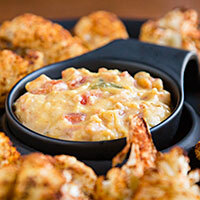 Thank you to reader Judith for suggesting Buffalo cauliflower bites for the Super Bowl edition of my newsletter. And thanks for the inspiration from PETA’s Spicy Buffalo Cauliflower “Wings” and The V Word’s Roasted Buffalo Cauliflower Bites. Both recipes look delicious, though I’d skip the oil and substitute my Tofu-Cashew Mayo for the margarine. For more Super Bowl party ideas, be sure to subscribe to NewsBites. I’ll be mailing out the Super Bowl edition to new subscribers all this week, so it’s not too late. Non dairy milk? Is that dried? I’m confused. No, it’s just regular soy milk, almond milk, rice milk, hemp milk, etc., whatever non-dairy milk you usually use. I just saw this and I’m honored that I could have inspired you. I’m a big fan of yours. Thank you so much! Hey I love your recipe and can’t wait to try it out. Just a quick question are there any other extra calories from the spices for the roasted cauliflower? Your 65 calorie per serving for 6 servings bring it up to 390 calories but I google and found a large head of cauliflower only has roughly 200-250 calories so I was just confused. I just tried this dish tonight and got 2 thumbs up from my husband! The sauce was very flavorful and made us feel like we were really eating nacho cheese sauce. 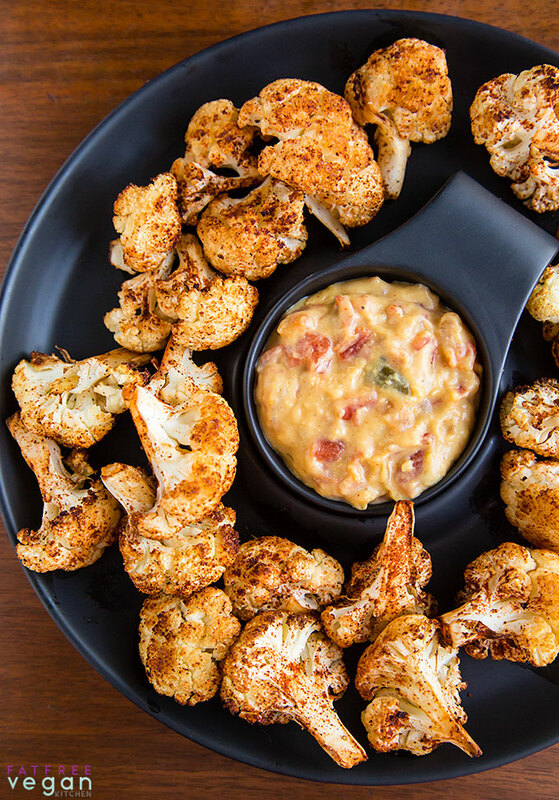 The healthful cauliflower bites made for guilt free snacking. Thank you so much for posting this. I made the cauliflower but used homemade ranch seasoning and they were so good! As another commenter said, they definitely satisfy a junk food craving! My husband really liked them too and he’s usually not a fan of stuff like that. I also made the “queso” and it is by far the best “cheeze” I’ve had. I personally didn’t like how much tomato flavor and texture the rotel gave it so next time I’m going to just use salsa to taste. Can’t wait to try it in a baked mac and cheeze! I made the roasted cauliflower and the sauce last night. It was delicious! I will certainly keep this recipe and make it again. Cauliflower is so underrated, isn’t it, and that cheese looks great – a very interesting recipe. I can’t use the nutritional yeast though. Is it an absolute must to have in the recipe? Is there maybe an alternative to the yeast or maybe best to leave it out all together if I can’t have it? The yeast is what makes the cheese sauce cheesy. You could try leaving it out, but it wouldn’t be the same without it. Delicious! I added 1/2 can of reduced sodium great northern beans which really made it creamy. I am not a fan of processed cheese nacho sauce but I really liked this. I’ve made this cheese sauce 3 times in the last two days – made a few tweaks until perfected to my taste. I subbed the dry mustard for 1/2 tbsp dijon mustard, used white sweet potatoes because I can’t get the orange ones where I live, omitted cumin, and used a 4-ounce can of diced green chilies instead of Rotel tomatoes. It is sooo delicious and is going in my favorites file folder. I just baked up some tortilla chips and this made the best dip! Thanks for another great recipe. The Nacho sauce looks good and thinking of trying. Do you pre-cook the sweet potatoes before smashing? Yes! Sorry, I should have specified that. Thanks for asking!